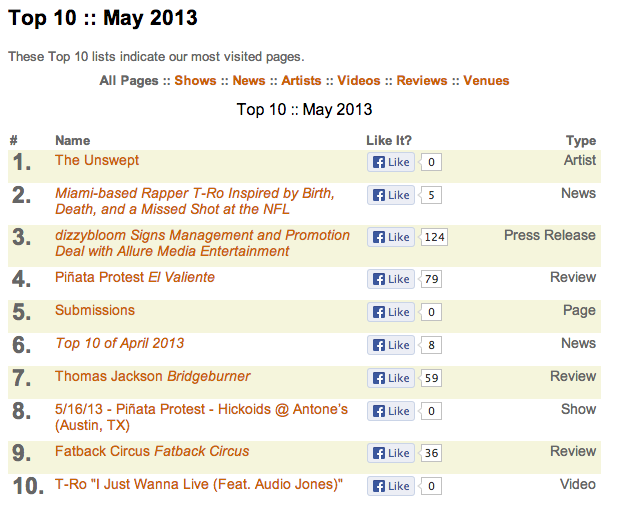 Announcing the Top 10 most visited pages on CoyoteMusic.com in May 2013! CHICAGO WINS THE WORLD SERIES!!! Okay, not quite, but Chicago duo The Unswept did capture the top spot on our monthly re-cap of the hottest things on Coyote Music's website. Miami rapper T-Ro took up 20% of the Top 10 this week, coming in at #2 with the article we did on him back in April. Then his video for "I Just Wanna Live" snuck in at #10. Austin-turned-Utah prog-pop band dizzybloom earned the #3 position this week with the press release announcing their new management and promotion deal with Allure Media Entertainment, out of New York City. Though the band took a sympathetic hit when singer Amy Whitcomb was released from Team Adam on The Voice, they're going strong assembling a team to take the band to new heights on the national scene. Piñata Protest occupies another 20% of the countdown this month, with our review of their latest album El Valiente taking the #4 spot. 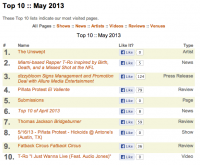 And their Austin CD Release show at Antone's, with label mates The Hickoids, was the eighth most popular page on our site. As things stay busy with us, our Submissions page keeps attracting new bands, winding up at #5. And last month's Top 10 took the 6 spot. We ran across a stellar singer/songwriter in May by the name of Thomas Jackson. Our review of his Bridgeburner album is #7. And lastly, though not in numeric order, the #9 spot is held by our review of the eponymous release by Austin rock band Fatback Circus. Thanks for reading along, and we'll catch you next month!